A columnist in USA Today was shocked at how high school differs today from the teen years we spent there. The reporter was shocked (shocked!) to find kids eating in the classroom with apparently no repercussions from the lecturing teacher. I was shocked, too. We used to get detention for chewing gum! We eat EVERYWHERE. This is one of the reasons we have a public health obesity crisis. We eat whenever food is available. We eat while we’re walking to get from Here to There. We eat when we get There. We’ve blurred the lines between mealtimes. We’ve lost our societal ability to discern hunger. Once upon a time there was a public health crisis caused by cigarette smoking. How did we address smoking (in part)? We’ve curtailed locations were smoking is legal. My idea, very simply, is to similarly legislate WHERE people can eat. Our public schools are in crisis. The declining quality of education has long been an issue at the highest—presidential, even—levels. Let’s sanctify the classroom with a national law against eating while teachers are lecturing. It’s sure to result in more kids paying closer attention to their instructors. There’s a time when eating is encouraged. It’s called lunch. 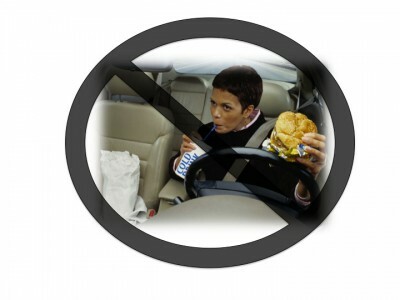 Here’s a statistic that will make you think differently about eating behind the wheel: 94% of those surveyed by the National Highway Traffic Safety Association think eating while driving is a threat to their and their passenger’s safety. This is almost exactly the same number (97%) as those who think cell phone use is a threat. Many states have already legislated against talking on the cell phone while driving. By creating a DWE (Driving While Eating) law, we can make our highways safer at the same time we eliminate another opportunity for calorie ingestion. Our MIS guy tells me I should stop eating at my desk. Apparently, my keyboard is gunked up with the remnants of 16 years of lunch at my desk. I could simultaneously appease him while following the advice of Mireille Guiliano, author of French Women Don’t Get Fat. Her best-seller advocates seriously concentrating on lunch—instead of the computer screen—to magically lose weight and, I hope, gain the ability to smartly wear a scarf, like French women. According to a study done by the Center for Disease Control & Prevention (CDC), the airline industry spent $275 million on 350 million extra gallons of fuel in 2000 to carry additional American paunch. I ask you: do we really need a beverage and a 200 calorie snack on a 35 minute flight from O’Hare to Green Bay? Even if you are starving and dying of thirst, the minute you step off a flight, you’re within a Snickers’ distance of calories and a water fountain of hydration. Let’s help the airline industry stay aloft by eliminating thousands of dollars of needless calories from their balance sheet. Do I really believe this is how we should attack the obesity crisis? Let’s just say you can call me Jonathan Swift. And this is my modest proposal. 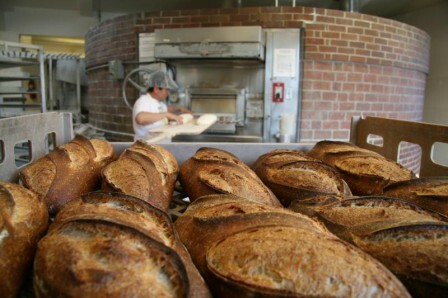 Check back later for some fresh-out-of-the-oven news about discoveries in the fields of taste and food development.